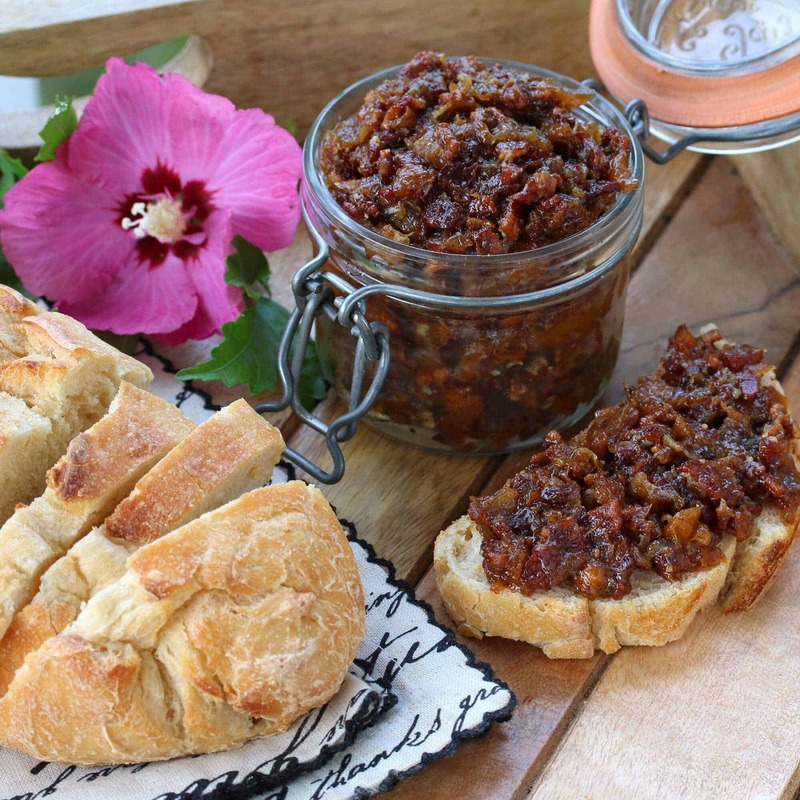 Get ready for the ULTIMATE bacon jam! The combination of flavors will absolutely “wow” your taste buds and have you coming back for more! 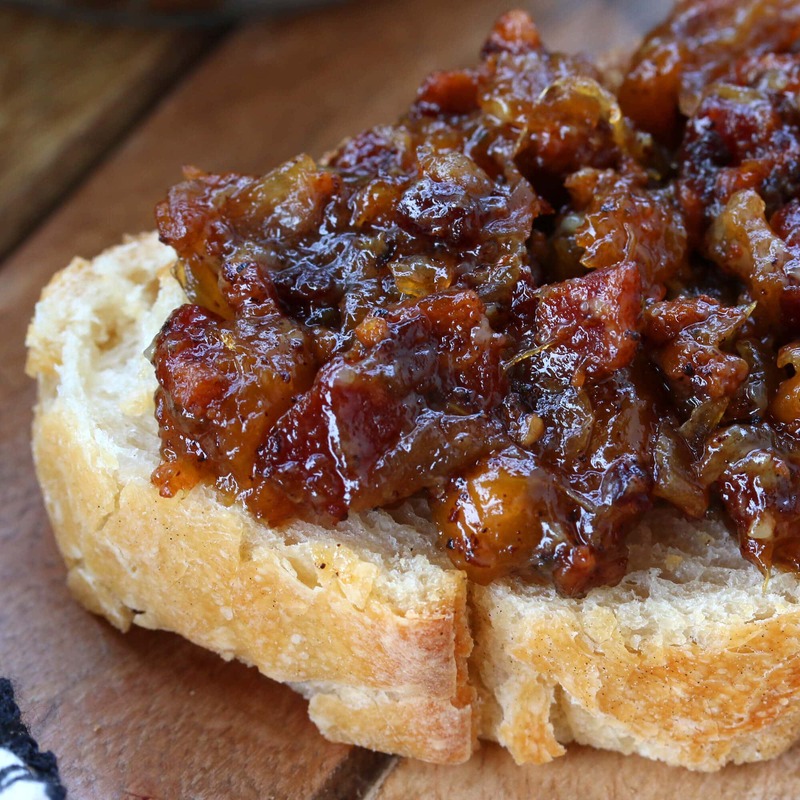 Chomping down on some crispy-chewy bread spread thickly with this Peach Bacon Jam is pure heaven! 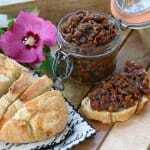 I’ve been wanting to make some bacon jam for a while but time always escapes me. I picked up a bulk load of peaches (75 pounds!) a few days ago and have been exploring a variety of ways of putting them to use. 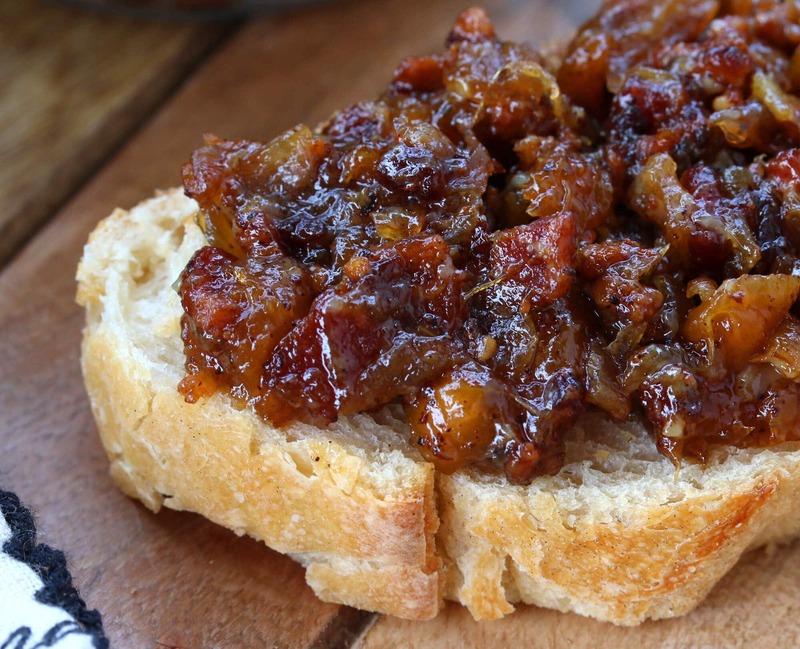 It’s then that I knew it was finally time to make that bacon jam – with peaches! 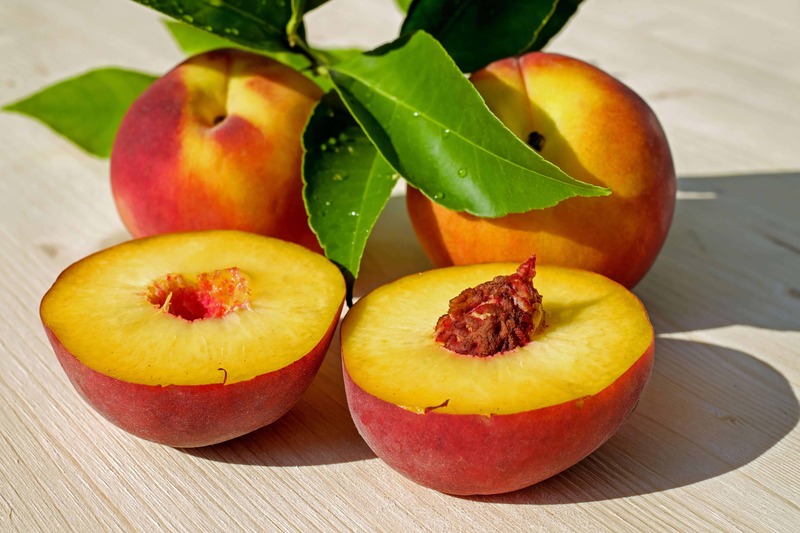 Peaches and bacon are a delightful combination – the pairing of sweet, acidic, salty and savory. So I thought I’d try incorporating them together into a bacon jam. It was an inspired move because this sweet-savory spread for bread and cheese will make you swoon! Wonderful for casual snacking as well as entertaining – serve this as an appetizer or as bite-sized hors d’oeuvres. Your taste buds will sing! Fry the bacon until crispy. Remove half of the bacon fat. Add the onions and cook until golden, about 10 minutes. Add the remaining ingredients and bring to a boil. Reduce the heat to low and simmer, uncovered, for 35-45 minutes, stirring occasionally, until it’s a rich brown and spreadable consistency. Discard the thyme sprigs. Your Peach Bacon Jam is ready! Store it in the fridge in an airtight container where it will keep for up to two weeks. Ideally served at room temperature, so leave it out for a few minutes before using. 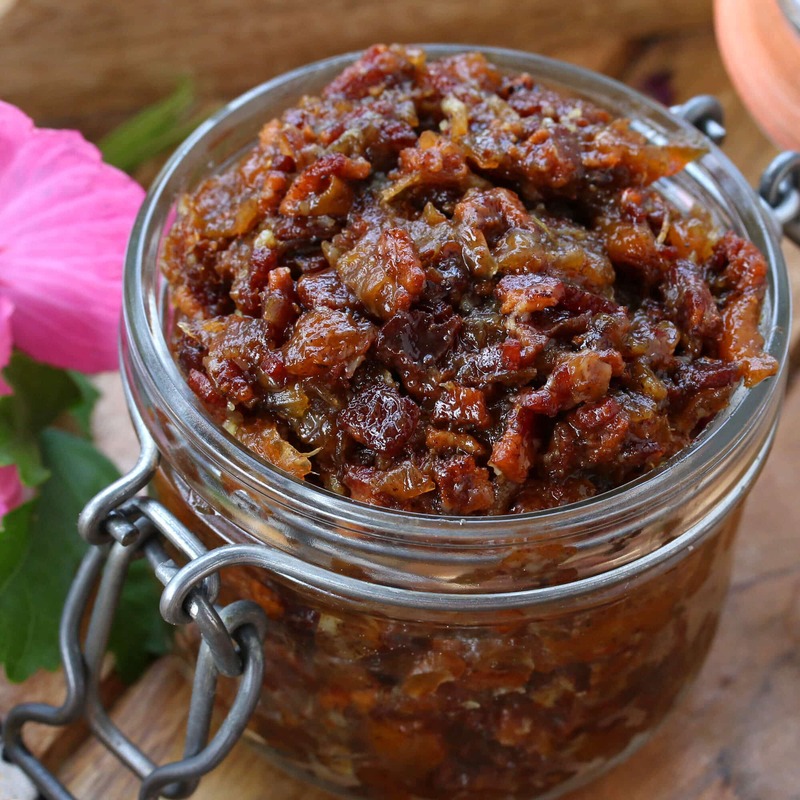 Peaches and bacon are a match made in heaven and this incredible Peach Bacon Jam stands as a delicious testament to that! Enjoy this as a casual snack on crusty bread and for entertaining - serve as an appetizer or bite-sized hors d'oeuvres. In a medium-sized heavy pot (e.g., Dutch oven) fry the bacon until crispy. Remove half of the bacon fat. Add the onions and cook until golden brown, about 10 minutes. Add the remaining ingredients and bring to a boil. Reduce the heat to low and simmer, uncovered, for 35-45 minutes, stirring occasionally, until it's a rich brown and a spreadable consistency. Discard the thyme sprigs. Store in an airtight container in the fridge. Will keep for up to two weeks. Best served at room temperature so let it sit out for a few minutes before serving. Thank you so much for bringing this into my life!! It looks fantastic!! I have peaches to use up this weekend! Making this for Thomas! This is the best jam ever! I could eat it by the spoonful! OH MY this sounds like heaven in your mouth! My only comment is its so late now for good peaches locally, will have to wait till next summer to make this. 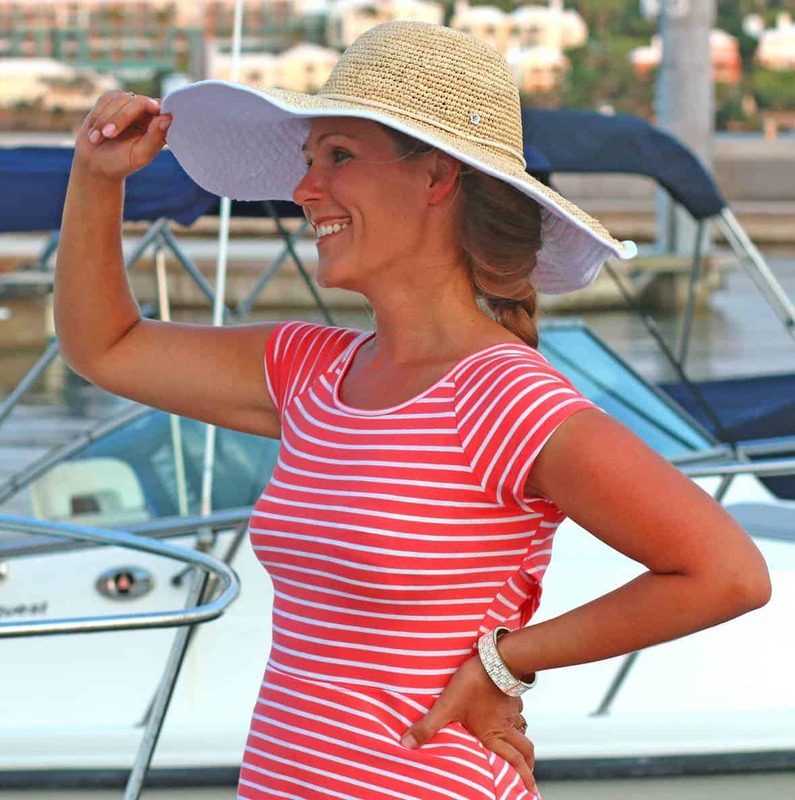 Summer’s coming and this is at the top of the list. I can already taste it! Bacon just makes everything better! I know you said it’ll last for 2 weeks in the fridge but this will be eaten so fast, it’ll be gone way before that! 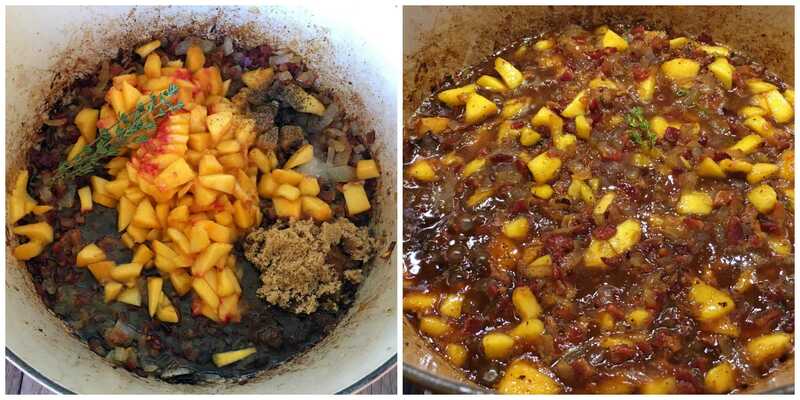 I love making bacon jam, but never thought to add peaches! I think I could live on that stuff! Wow…I must do this really son. The bacon on this must make the recipe taste to the next level. What a great combo! I want to eat this on all the things!!! Just made it~ just ate it~ Just gimme some more!! Fantastic, Bob! So glad it was a hit, thank you! 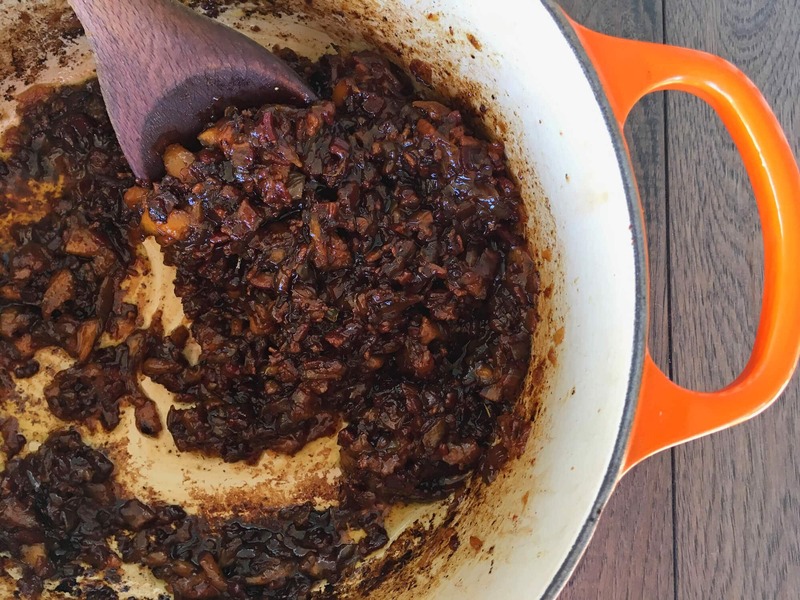 Bacon jam is my jam and then you went and ahead peaches. UM YEAH! Using canned peaches works great!! So glad you enjoyed this, Peter, thanks! Can you make this jam in a larger quantity and then freeze it? It sounds so delicious – I love peaches and bacon separately! Anxious to try this jam soon. Can this be canned for later use? Hi Barbara, because there is meat in it it would have to be pressure canned (not water bath canned) but I’m not sure off-hand how long or how many pounds of pressure. Thank you. I’ll probably try and process it the same way I do my other meats.